To be honest, what really urged me to write an article dedicated to dog muzzles right now was an unpleasant personal experience while walking my dog: a chunky large breed (won’t name the breed because, as a person who’s been involved with animals and veterinary since childhood, I don’t want to give the wrong assumption that this always applies to other dogs of the same breed – it comes down to training and good parenting) attacked my own companion in the nearby forest whose owner couldn’t handle another one of her dogs in the meantime, let alone this large beast. After some struggle, we managed to solve the unpleasant situation – my smaller dog got home with an unserious wound only, luckily. With that being said, I’ve actually wanted to touch the topic of dog muzzles for quite a while, and, on a somewhat more positive note, not solely due to such problems as described above – they can be really useful for dog training, grooming, and, in some cases, to prevent or recover from injuries (even usage of muzzles for cats isn’t a surprising scene for veterinarians). But you have to be careful when choosing the best dog muzzle for your companion – the issue is, not all muzzles for dogs available on the market are designed humanely and appropriate for your breed specifically. 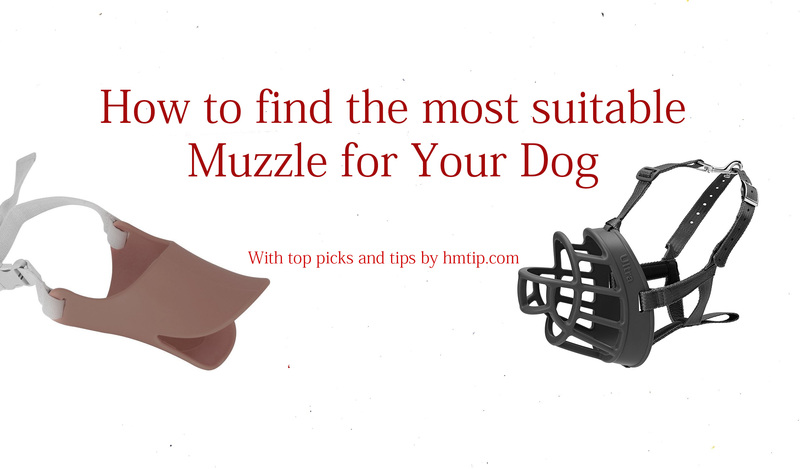 For this reason, we have created a list of top dog muzzles suited for different dogs – I encourage you to pay close attention to the details of each individual review. What to look for in a dog muzzle? The right size and appropriate overall fit. It’s a good idea to measure the length (from the dog’s eye line to the very tip of the snout) and circumference of the dog’s snout. It’s also beneficial to know the appropriate strap length (you could take two measurements – from the back of your pet’s head behind its ears to the aforementioned eye line and also neck circumference). A muzzle that allows normal breathing. By all means, you want to avoid difficulty to breathe and high risk of overheating. HM tip: You want to prevent your companion from developing a negative association for being muzzled. We advise you familiarize your dog with the muzzle in a positive approach. We recommend you follow 10 simple steps to familiarize your dog with a muzzle found towards the end of the article. More than yourself, we believe the one who will appreciate this one the most (out of most muzzles on the market) is your four-legged companion. The acceptance and high praise of Baskerville Rubber Ultra Muzzle can be largely contributed to comparatively big snout space for more convenient breathing (and even drinking and eating some treats), as well as the softer, more comfortable material that’s used. Despite the wider webbing, this muzzle provides the desired safety. HM tip: In general, rubber basket-style muzzles are best choices when it comes to optimum safety in combination with high level of comfort. Baskerville Rubber Ultra Muzzle has secure and fully adjustable neck and optional overhead straps. You can choose from 6 different sizes (2 colors) which is more than most other models offer, therefore, in addition to the aforementioned features, it shouldn’t be an issue to find the right fit for your dog (please see the chart below – the numbers are provided by the manufacturer). Overall, it’s definitely one of the best options out there. Know that this model was designed to fit most dog breeds, even the ones with shorter noses (such as Boxers) if adjusted accordingly. Now, if our first pick wasn’t durable enough for the most aggressive and strongest jaws, this genuine leather basket dog muzzle by Dogs My Love will definitely be of great aid. Despite its close fit, the muzzle provides proper ventilation. There are 3 adjustable straps that firmly hold it in place, including the middle overhead strap that connects to the two straps and the dog’s collar. 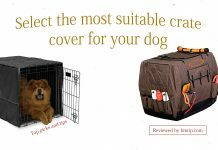 Real Leather Cage Basket Secure Dog Muzzle allows for panting, which is important when the dog is physically active, and this muzzle is recommended by dog trainers if the trainee is a large and aggressive dog. One drawback for some might be that this muzzle won’t allow for drinking or eating. Looking at it from a different perspective, though, it prevents your dog from eating waste or feces in public places (if the dog is prone to that). Overall, it’s one of the most durable (challenged only by some metal-based muzzles) and well-fitting (if suitable size) dog muzzles right now. Note: The sizes for this specific model are: Circumference 11.8″, Snout Length 3.5″. 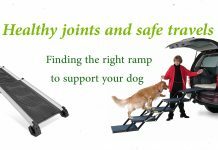 If that’s not for your companion, please know that the manufacturer offers other models with different sizes – please choose the most appropriate. For large yet less aggressive chewers, Niteangel Quick Fit Nylon Dog Muzzle is a very nice option – it’s made of quality nylon, is quite durable yet very comfortable and lightweight. What’s even nicer, when you order this product now, it comes with both different sizes (none are appropriate for small dog breeds) supplemented by a measuring tape but the price is still very low compared to some of the other best dog muzzles currently on the market. The muzzle is well-adjustable and should be enough to put others at ease as well. The main drawbacks are the limited size variation (though adjustable, still not suitable for smaller dogs) and the fit, obviously, isn’t as secure as for the previous two picks. Speaking of smaller dog breeds, Elite Mix Duck Mouth Shape Muzzle is a very solid option worth considering. It is made of soft material (cozy Silicone that is non-toxic and non-odor) that prevents injuries from scraping and scratching. Obviously, this muzzle is drastically different from the previous picks, however, in addition to the aforementioned features, it also serves the main purpose of a dog muzzle – prevents your dog from biting others. There you have it – 4 unique and well-made muzzles for different dogs. These are the top quality dog muzzles within their category/type; Let us know if you’d like us to elaborate on a certain type of muzzles, or any other educational information.